In Early February, the Board of the The Southeast Regional Sea Turtle Network (SERSTN) welcomed over 300 people to the organization’s second gathering on beautiful Jekyll Island GA. After a successful inaugural event in 2012, the Southeast Regional meeting is becoming a valuable alternative to the often far-flung International Sea Turtle Society meetings, which will be, for example, held in Turkey this year. Many thanks to President Kim Sonderman, Vice Presidents Dean Bagley and Terry Norton, Secretary Matthew Godfrey, and Treasurer Meghan Koperski for leading a talented team of organizers and volunteers that made this year’s meeting a truly memorable event. 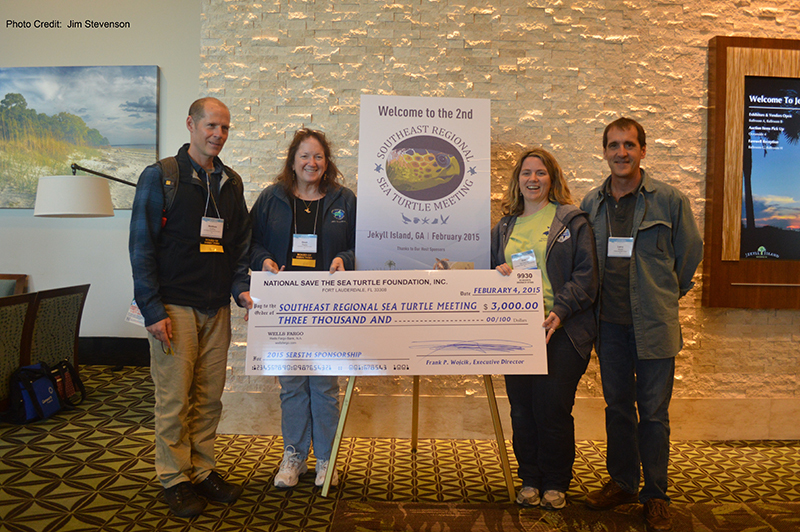 The National Save the Sea Turtle Foundation was a major meeting supporter by providing a $3,000 “Leatherback Level” sponsorship to the Southeast Regional Network’s Board of Directors. National Save The Sea Turtle Foundation Biologist Larry Wood (far right) presents a $3,000 Sponsorship to Southeast Regional Sea Turtle Network Board Members Matthew Godfrey, and Dean Bagley (on left) and Meeting President Kim Sonderman. To open the meeting, the University of Central Florida’s Dr. Kate Mansfield reflected upon his year’s theme, “Further: Pioneering the Future” in her keynote presentation. Entitled “Coming Out of Our Shell: Changing Perceptions and New Hypotheses”, she encouraged the audience to seek new ways to connect the increasingly complex ‘quilt’ of our global understanding of sea turtles and their habitats. Advances in remote sensing technologies are confirming how closely tied we are to distant locations via the movement of the animals we study. Dr. Mansfield reminded the research and conservation community of the global impact of their individual efforts, and encouraged young scientists to keep seeking answers to the many tough scientific questions that remain. Several days of posters and oral presentations followed, including the a poster and talk by Foundation’s Education Specialist Rebecca Mott and Biologist Larry Wood. Sessions were divided into topics that included region-wide research, satellite tracking, State sea turtle programs, foraging and developmental habitats, nesting beaches and hatchling production, health and rehabilitation, sea turtle education programs, and conservation and volunteer programs. One of the highlights of the week was a special evening presentation entitled “Sea Turtle Pioneers- Stories of Trailblazers”. This retrospective provided an opportunity to share stories about some of the truly inspiring people that led the way in the early days of the sea turtle conservation movement. The National Save the Sea Turtle Foundation’s biologist Dr. Larry Wood began the session with the story of famed Palm Beach scuba diver Norine Rouse, followed by five notable speakers who reflected upon sea turtle trailblazers Henry Hildebrand, Bill Baldwin, Ila Loetscher, Ross Witham, and Bob Shoop. Many positive comments were generated from the event, and it is likely to become a fixture in future meetings. The week officially ended with a evening social that included student awards and the induction of the first member of SERSTN’s Sea Turtle Hall of Fame. Among other fine awardees, Florida Atlantic University graduate student Karen Pankaew received best poster presentation for her work with hatchling energetics. The Hall of Fame awardee was Dr. Peter Pritchard, arguably the most influential and accomplished turtle scientist in the world. His long career has taken him to nearly every country on Earth exploring the diversity of the world’s turtles, to his many books and publications, and ultimately to the Chelonian Research Institute that he founded in Oveido, Florida, which now houses the second largest collection of turtle specimens in the world. His accomplishments are only matched by his warm and friendly personality, and as it has often been said, “if the turtles could vote, he’d win Earth’s best human.” The meeting then ‘unofficially’ ended Saturday with a series of participatory workshops focused on sea turtle lighting issues, satellite tracking, and volunteer programs. Throughout the week, a large variety of items were bid on for the silent auction, including a lunch outings with “Celebrity Sea Turtle Scientists” Blair Witherington and Larry Wood. Special tours of the Georgia Sea Turtle Center were offered to meeting attendees, and plenty of time was allowed within the busy schedule for socializing and networking. All those involved in the organizing of this meeting should be commended for their hard work to create a very successful event. Learn more about the Southeast Regional Sea Turtle Network at http://www.serstm.org.